All the scales columns fold down and latch securely for easy transport and vertical foldup storage requiring minimal floor space. Detecto's P220 desktop printer boasts a surprisingly compact footprint without compromising performance or value. 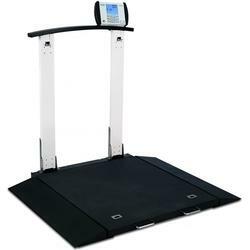 The P220 can connect via serial port with any Detecto digital scale that has serial output capabilities, including any medical scale featuring the 758C weight indicator. This 2-inch print width printer offers a multitude of user-friendly and innovative features, all packed in a small, but sturdy double-walled casing. With its electronic platform, the P220 delivers high-quality bar code label printing at 3.5 inches per second and is ideal for Point of Sale or product marking in Food Service use or patient tracking or medical record keeping in Health Care use. Quality thermal tape printers with high speed processor for a true print speed of 100mm per second. Quality design for low cost receipt printing with the added cost effective flexibility of a unique tear bar version. Quality engineering providing user-friendly features including easy paper loading, 58mm paper width option with user installable paper guide (80mm standard) and two colour print capability (red and black or blue and black). "Drop and Load" Easy Print - It couldn’t be simpler – open the case, drop the new roll of paper in and shut the lid! WinDDE Server communicates with up to 20 weight indicators attached to a computer. Weight indicators may be connected using standard computer serial ports or via ethernet using TCP/IP. The weight and status of the weight indicators is made available to spreadsheets, databases, and industrial control applications by means of Dynamic Data Exchange, or NetDDE for networked computers. Weight and time stamp information may be automatically captured to Excel® creating a new row of information for each stable weight above threshold. Alternatively, the capture feature may be based on the indicator print button to capture a row of data each time the print key is pressed on the indicator. Weight Monitoring Industrial Control Software such as Rockwell RSView®, Automation Direct®, Lookout Direct®, and spreadsheet programs, such as Microsoft Excel® may be used. A spreadsheet cell, such as A1, shows continuously updating weight. The spreadsheet may show a continuously updating bar graph. Formulas in the spreadsheet may show a flashing indication if the weight exceeds or drops below certain levels. The WinDDE command for the spreadsheet to read weight is simply =windde|scale!wt Automatic Stable Weight Capture to Excel® After a weight is placed on the scale and the indicator sees a stable weight, the weight is placed in a spreadsheet cell, such as A5. The operator removes the weight, and the procedure is repeated, but the weight value is placed in the next spreadsheet row, such as A6. Printer Port Capture to Excel® After a weight is placed on the scale, the operator at the indicator may press the Print key on the indicator. Instead of printing, the printout information from the indicator is sent to the computer. The computer sets the spreadsheet cells, such as E3 Gross Weight, F3 Tare Weight, G3 Net Weight, etc. The operator then may remove the weight, and the procedure is repeated, but information is placed in the next spreadsheet row, such as E4, F4, G4, etc. Computer Data Collection After a weight is placed on the scale, the operator may type information at the computer, such as an ID number to associate the weight. The computer stores the information in a database or spreadsheet. 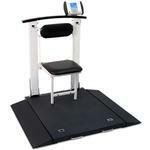 The operator then may remove the weight. With certain weight indicators, such as the Cardinal model 220, weight monitoring, automatic stable weight capture to Excel® and printer port capture to Excel® can be used simultaneously. Windows® 2000 or XP must be used if more than ten indicators will be connected. Microsoft Excel®, Microsoft Access®, Wonderware InTouch®, Automation Direct®, Lookout Direct®, and Rockwell Automation RSView® are just a few of the well-known applications which can be used with WinDDE. Connectivity solution allows capture and viewing of DETECTOs 1LOOK weight, height and BMI measurements and automated data transfer to EMRs. Welch Allyn, a leading global provider of medical diagnostic equipment, has partnered with DETECTO, America’s largest healthcare scale manufacturer, to enable automated interface between the Welch Allyn Connex® Vital Signs Monitor (Connex VSM), the Welch Allyn Connex® Integrated Wall System (Connex IWS) and select DETECTO medical scales. 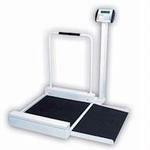 Connectivity-ready DETECTO medical scales included under the agreement include eye-level and waist-high electronic column scales for physician and hospital settings, bariatric, wheelchair and visiting nurse scales (listed below) — designed to accommodate every kind of patient need quickly and accurately. These scales operate digitally and are equipped with BMI, easy-to-read display, and auto-off features, plus several models feature digital height rods to speed the measurement process. These scales feature DETECTO’s unique 1LOOK feature which displays height, weight, and BMI all onscreen simultaneously to be viewed in one scan of the eye for efficient patient recordkeeping.